The string trimmer (aka weed wacker) can be one of your best or worst friends when it comes to managing your lawn care. The general idea of the tool, is that it gives you the ability to manage areas that your mower can not reach. Some major concerns can arise if the tool is used incorrectly! 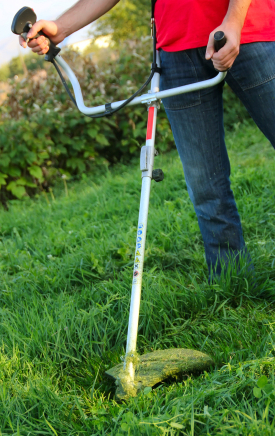 When using a string trimmer some will say that you want to trim the hard to reach areas before you mow. Personally I find it easier to tell where to you need to trim after you mow the majority of your lawn. Try out each way and decide which you prefer. String trimming is meant to clean up the edges, while matching the height of your lawn. You want to trim so that you are consistent with the rest of the yard. Scalping is the process of running the trimmer too low causing damage to your turfgrass. This will also allow for more sun light to reach the soil surface, and encourage weeds to develop. Along with scalping your lawn, one of the biggest problems is incidental contact with other plants in your landscape. Because string trimmers are run near the ground, many times the fast moving string comes in contact with the base of trees and shrubs. Any injury to the base of a tree or shurb will cause a disruption of nutrients and water to the rest of the tree. This can cause death of your trees. Consider using tree rings around stand alone trees, and a properly edged bed in other areas. Make sure that you are using the proper fuel in your trimmer. Most run off of 2-cycle mix (a ratio of gas:oil), while others just gasoline. This can be found in your owners manual. Also in your owners manual will be the recommended string diameter that you want to use. This is important to keep the trimmer running it’s best!